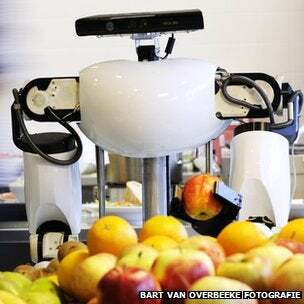 Scientists in Europe have set up an online database to help robots deal with objects and situations they encounter. The system will also do computational tasks that will reduce the need for on-board processors and therefore make future robots cheaper. This has potentially huge implications for things like self driving cars and mobile robots that need a lot of processing power just to navigate through their environment. It will also make it easier to disseminate the "Kill All Humans" order.